I made this Spring Orzo Salad recipe on Mothers Day, as it was passed on from my grandmother to my mother to me. What better way to judge a successful recipe than three generations of post-dinner party and family barbecue success? 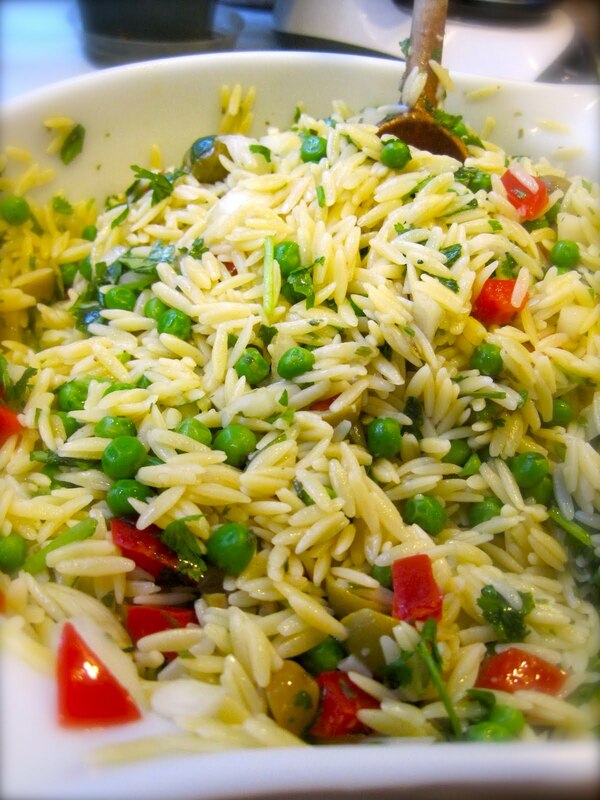 There is something undeniably perfect about the pea, olive, pepper and orzo combination; so much so that memories of this dish have stayed with me since I was a little girl. I put the recipe (handwritten on faded paper) to work today, and in its typical fashion, it received copious praise. Cook orzo according to package directions. While orzo cooks, combine olive oil, vinegar, salt & pepper, and tarragon. After orzo drains and is hot, pour dressing over top, and let cool. Fold in green/red pepper, parsley/cilantro, onion, and peas. Cover, refrigerate for at least 4 hours. Optional decoration: At serving time, pare cucumber, cut into quarters lengthwise. Cut strips into 1/4 inch pieces, and toss with orzo mixture.